As the snow melts from south and west facing slopes and along road edges, it’s time to scout for some very early spring wildflowers. Early bloomers grow low to the warming ground and utilize stored food in thickened roots to grow fast. Small flies, bee-flies, and bumble bees are typical early spring pollinators, flying only a few inches above the ground looking for nectar and pollen. Sagebrush Buttercup (Ranunculus glaberrimus var. ellipticus) is a harbinger of spring with its saucer-shaped flowers of 5 yellow petals, multiple anthers, and a protruding cluster of pistils. Leaves on the stem divide into 2-3 lobes, but basal leaves are usually elliptical and whole. Below ground is a bunch of thickened roots. 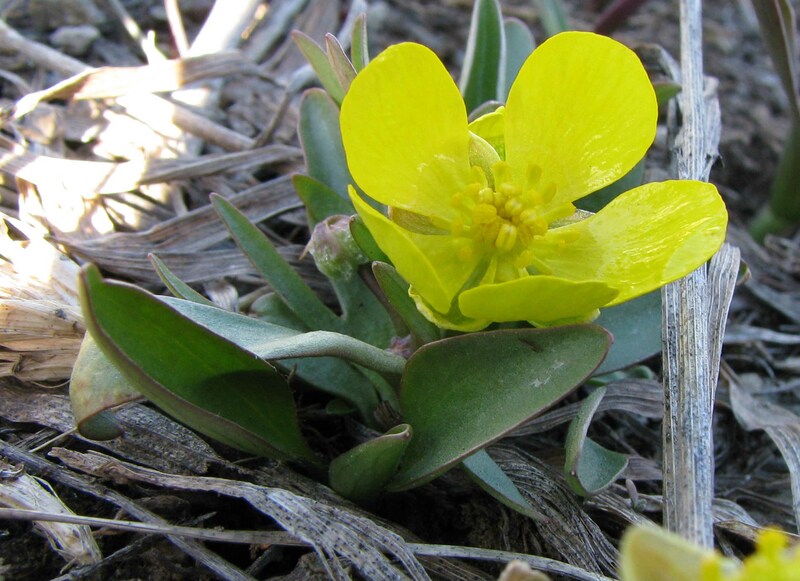 Sagebrush Buttercups are tasty to Sage- and Sharp-tailed Grouse , rodents, as well as mule deer in early spring. They are found on sunny sage flats such as Antelope Flats. Basal leaves of Utah Buttercup are 3-5 lobed. 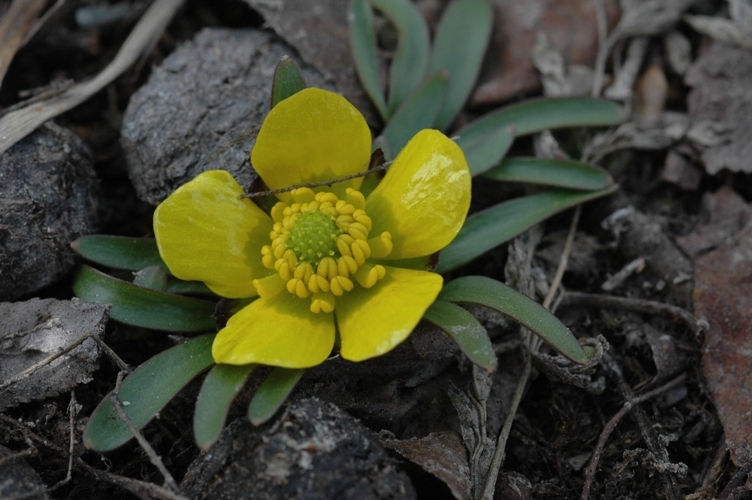 The look-alike Utah Buttercup (Ranunculus jovis) blooms a week or so later and grows in slightly shadier locations. The lower leaves are deeply lobed and the roots are a bit thicker than Sagebrush Buttercup. 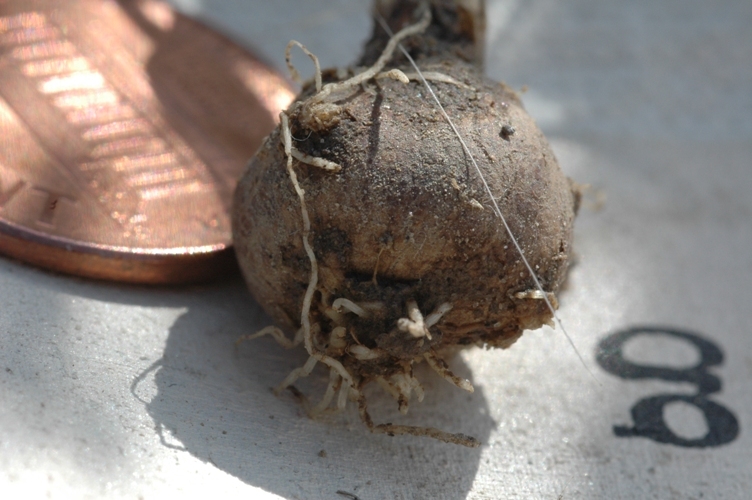 Utah Buttercup has large swollen storage roots. The flower clusters of Turkey Peas are smaller than a penny. 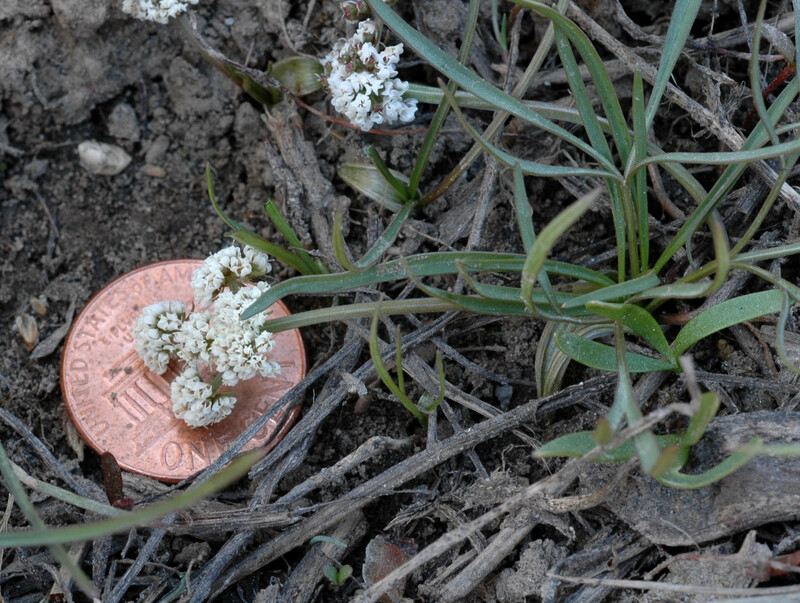 cluster of flowers is often less than a penny in size and the leaves are 2-3 times dissected and typically only an inch or two long. Five white petals of curve over two deep purple stigmas of Turkey Peas. Looking very closely with a hand-lens, you can see 5 white petals surrounding a deep-purple pair of stigmas in the center. The clusters of flowers are borne in an umbel (as in umbrella), one indicator that it is a member of the Parsley Family. 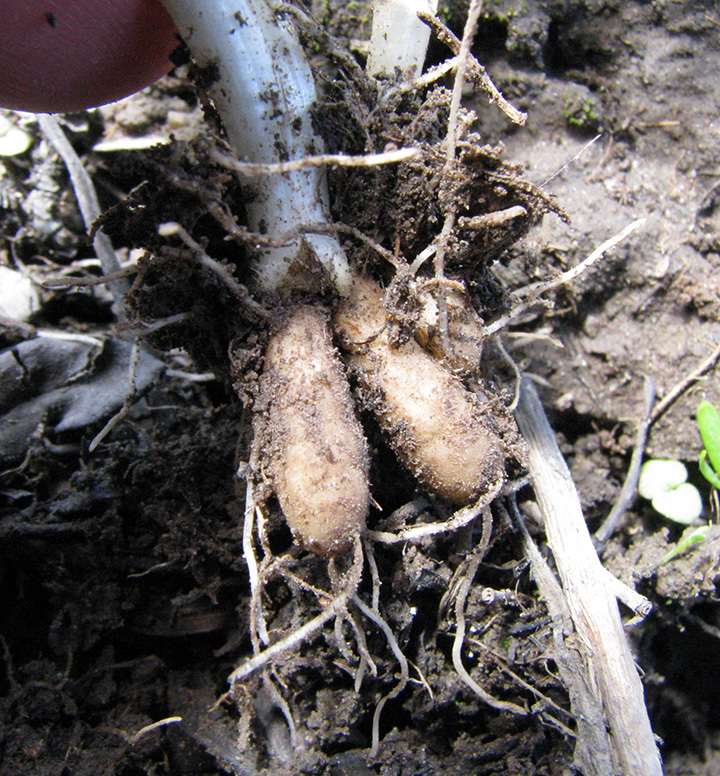 Turkey Peas has a bulb-like storage root- the “peas” relished by wildlife. Look for very tiny flies and bees pollinating them. Below ground are the “peas,” thickened, roundish roots about ½ inch in diameter. 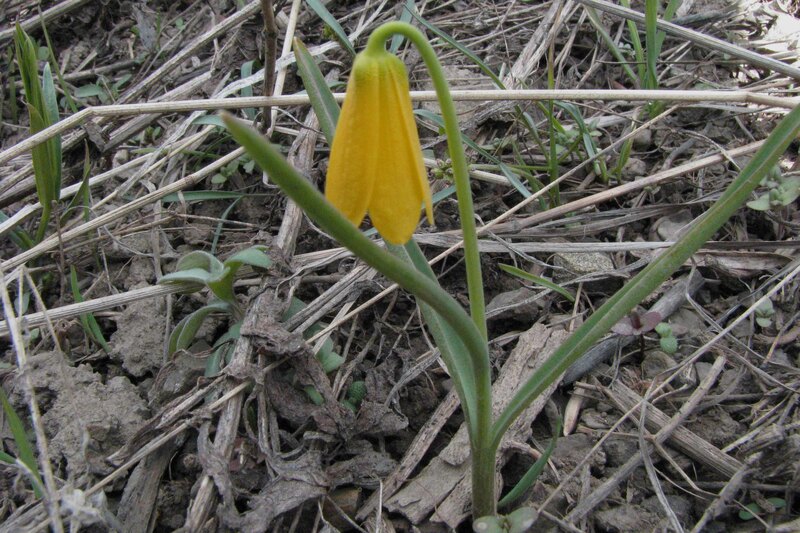 Yellowbells (Fritillaria pudica) hasn’t been reported yet, but search for 2-3 lily-like leaves only 3-4” long, and a nodding, single yellow bell. The flower has 6 yellow tepals (3 sepals and 3 petals that look alike). Note the 6 stamens inside. The linear leaves and flowers with parts in multiples of 3s are keys to it being in the Lily Family. This plant has tiny bulbs which are eaten by rodents. Flowering Trees and Shrubs: It is easy to overlook wind-pollinated species as their tiny flowers are inconspicuous—they don’t advertise to pollinating insects. 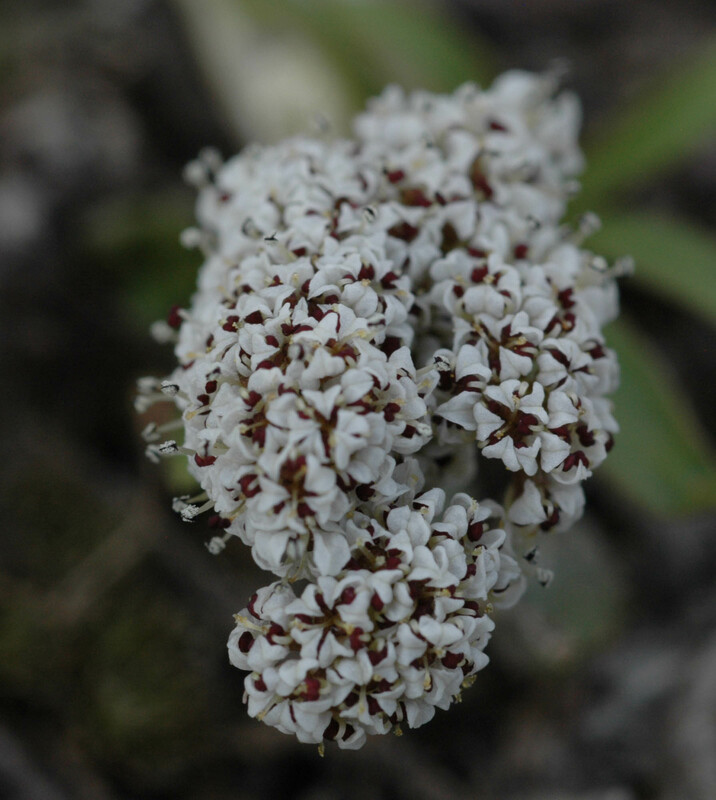 Often, wind-pollinated species have separate male and female flowers. Often these very tiny flowers are arranged in long clusters called catkins. 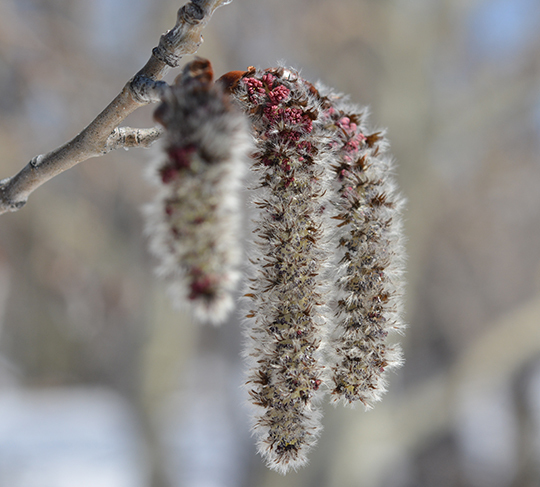 Sometimes the male and female catkins are on separate plants to help assure cross-pollination. Wind pollinated species typically bloom before their leaves come out, so the leaves don’t get in the way of pollen dispersal. 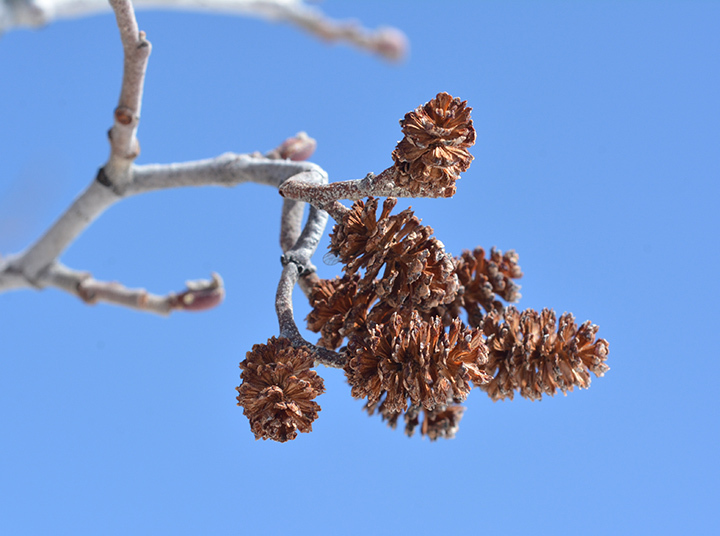 Quaking Aspen – dangling male catkins look like gray caterpillars – look for silvery hairs. Quaking Aspen (Populus tremuloides) is in bloom in Jackson and other warm spots in the southern end of the valley. Grayish “fuzzy” caterpillar dangles are male catkins stretching out into the wind. Female flowers are more closely held on the branches of separate plants, and often bloom slightly later. The separation in time and space ensures cross pollination, assuring a healthy mix of genes. Around ponds and along streams, 6-8 foot tall Mountain Alders (Alnus incana var. occidentalis) are flourishing. 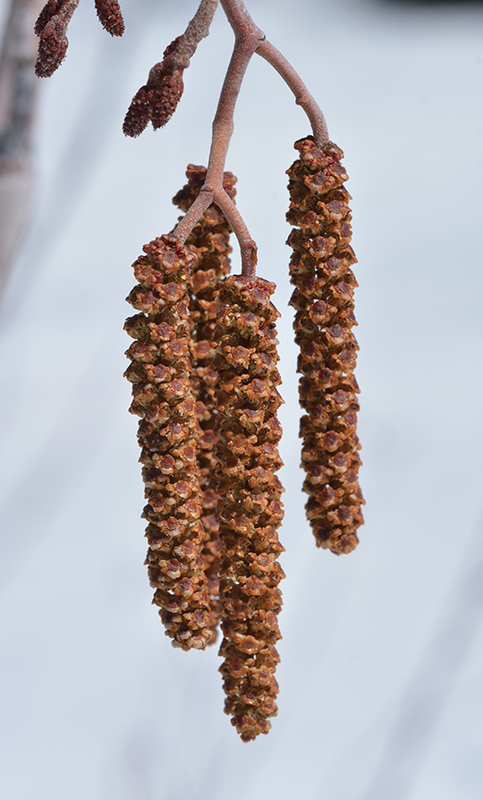 Mountain Alder male catkins are rusty colored just before they produce yellow pollen dispersed by wind. The rusty haze seen from a distance is from the catkins: male flower clusters dangling and swaying in the breeze. On the same twig are tiny female flowers held in tight, egg-shaped “cones.” Pollen from the elongated male catkins is blown to the female stigmas (take a close look) that catch pollen. Once pollinated, females will form seeds inside what look like miniature brown pine cones. Last years’ open brown “cones” may still be found on plants. 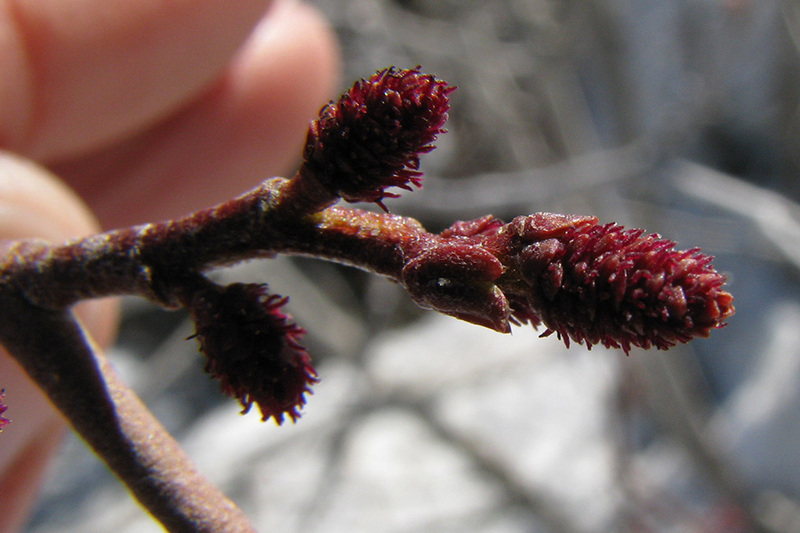 Female catkin of Mountain Alder, note crimson stigmas. Last year’s female “cones” of Mountain Alder help in identification of this wetland shrub. 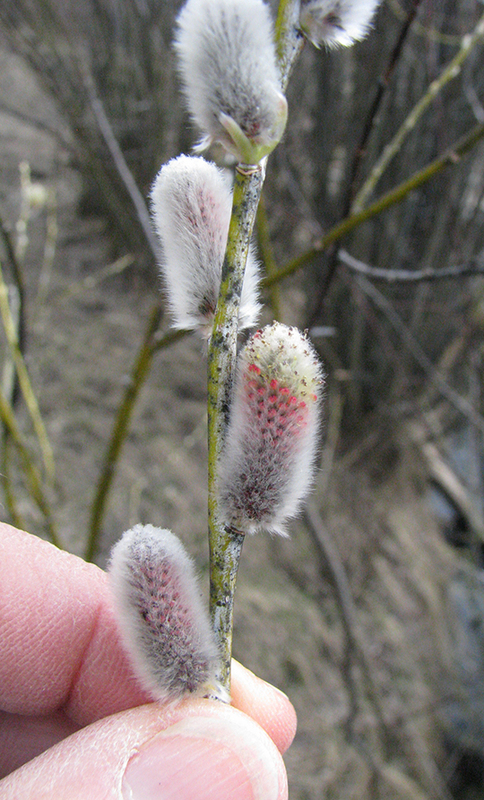 Booth’s willow – Male catkins or pussies. Enjoy the emergence of spring!